NCAA Football 14 offers three different matchups—Alabama vs. Virginia Tech, Oregon vs. Texas A&M, and the Ohio State-Michigan rivalry—when the game's demo arrives on Xbox Live and Playstation Network tomorrow. Alabama-VPI will be the preseason Chick-fil-A Kickoff Game at the Georgia Dome; Oregon will play at Texas A&M and Ohio State-Michigan takes place in the Big House. All games have three-minute quarters. As in past years, EA Sports is offering incentives for downloading the demo and telling friends to go get it, too. The incentives this time are card packs in the game's new Ultimate Team mode, which whose player population is drawn from current NFL performers as they appeared in college. Card packs will be awarded for completing a game and for sharing news of the demo. 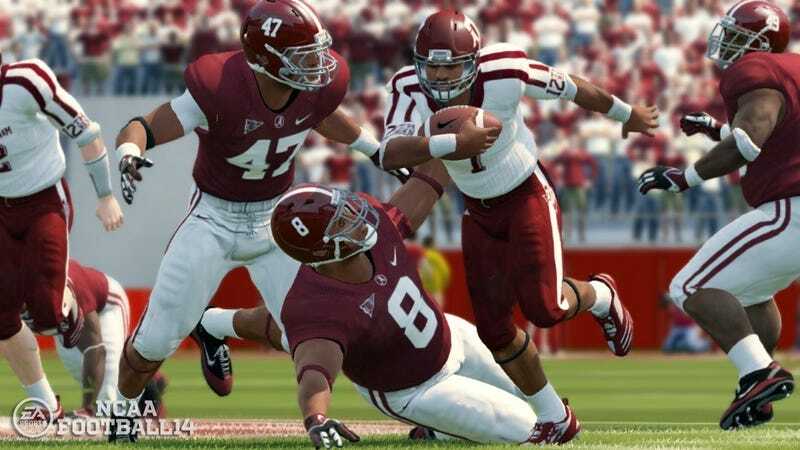 Xbox 360 owners will also get a special Heisman Ultimate Team item for downloading the game. Further, the new Skills Trainer minigame suite will be available in the demo, to let players familiarize themselves with the modifications and upgrades made to this year's controls and game engine. The full title will be on shelves on July 9.